At Tuke Heating we know that investing in a new boiler can be a big decision, especially if it is an unplanned purchase because your old boiler is beyond repair. Whether you’re looking for a new boiler that’s more efficient and economical to run, or a replacement for a boiler that’s broken down, as a company with many years of experience of boiler installations in Wilsden, we can offer the benefits of our expertise and impartial, no-strings advice to help you find the best boiler to suit your requirements. A huge range of boilers are available nowadays with a range of options suited to homes and families of all sizes. Combi boilers are the best-selling boilers in the UK: taking up very little space, a combi boiler will heat your water and radiators efficiently. As a general rule of thumb, combi boilers are generally most suited to smaller properties with very little or no loft space. As specialists in boiler installations in Wilsden, at Tuke Heating we’re happy to offer free, no-obligation quotes and advice on the best boiler for your home. 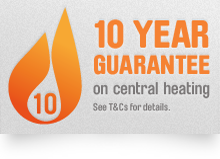 Once you’ve decided which is the best boiler for you, we can offer a complete boiler and, if required, central heating installation package. Our expertise has been built up during many years of providing boiler installations in Wilsden and we’re happy to offer a no-obligation quote or advice so why not contact us today? We’d love to hear from you!